African leaders, along with U.N. Secretary-General Antonio Guterres, at the 28th Assembly of the African Union, Addis Ababa, Ethiopia, Jan. 30, 2017 (AP photo by Mulugeta Ayene). 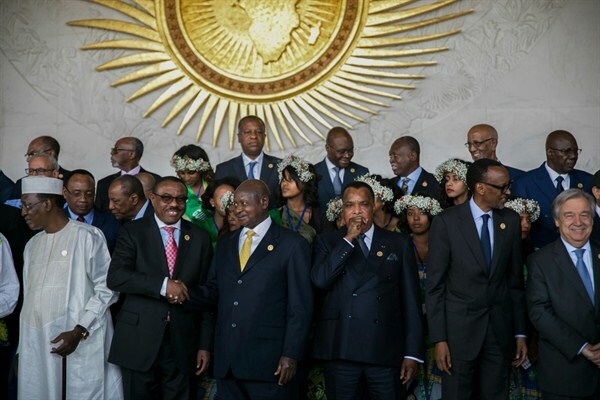 The African Union has a new face, following its summit last month in Addis Ababa, Ethiopia. Chad’s former prime minister, Moussa Faki Mahamat, is taking the reins as the new chair of the AU Commission. And for the first time, the AU’s membership now includes every nation on the African continent, following Morocco’s decision to return to the organization after withdrawing 33 years ago in protest over the status of Western Sahara.